Jeremy Bittermann, Scott Hall at Carnegie Mellon University, 2018. courtesy: office 52 architecture. 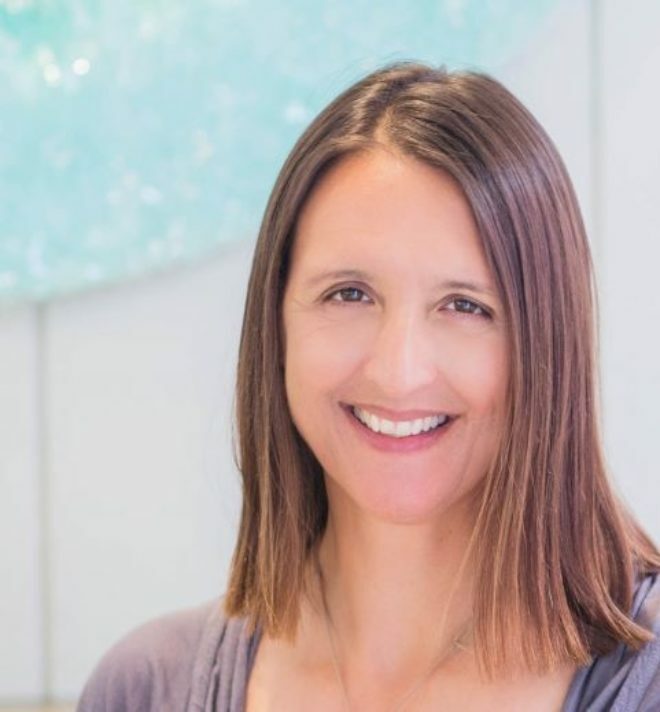 When she's not in her Portland, Oregon, architecture studio, Michelle LaFoe can often be found at Bullseye Glass Co., where she takes classes, attends visiting artist lectures, and indulges her general fascination with glass. LaFoe’s passion was sparked by Chagall’s iconic glass work American Windows (1976) a painting in which metallic oxide paints were permanently fused to the glass with heat. When, in 2011, LaFoe was asked to submit a proposal for a new building at a prominent university, she was able to bring together her glass interests with her professional practice. 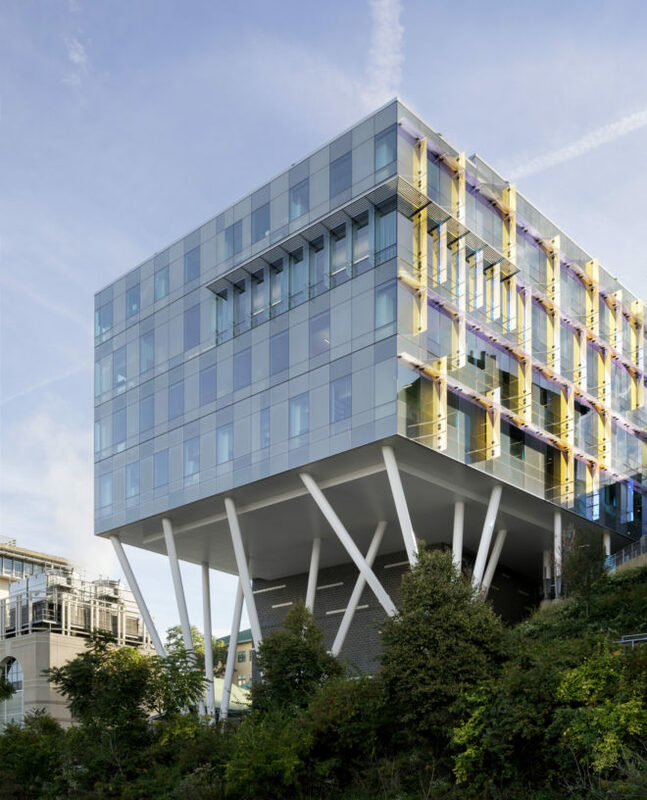 For what would become her and partner Isaac Campbell's largest project to date, she proposed a glass building that is alive chromatically as the dynamic scientific research taking place inside its walls at Carnegie-Mellon University's Pittsburgh campus. 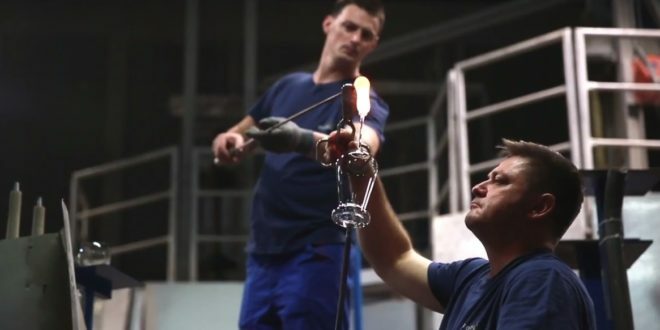 A still from a promotional video that succinctly documents the craftsmanship behind a new line of wineglasses. One should never underestimate the power of glassblowing to transfix an audience. But beware of overestimating it, either. A tasteful website for a new line of mouth-blown wineglasses keeps the theatrical presentation of the wonders of glassblowing to a bunch of still photographs and a minute-and-a-half video, but the process is still there to establish the craftsmanship behind a new line of glassware. A partnership with perhaps England's most-prominent wine critic, Jancis Robinson, the new Jancis Robinson Glassware Collection by designer Richard Brendon is his latest "heritage craft" undertaking. This spare product seeks to simplify the wine glass choices (see, in contrast, Reidel's highly successful varietal-specific glassware) and not only claims to provide the best single wine glass shape for all wines from champagne to port, but it also touts the refined craftsmanship behind the mouth-blown crystal glass from the skilled artisans of Bohemia. This collection offers one wine glass, two beautiful decanters (one for young and one for old wine) and a water glass that could double as a stemless wine glass, meticulously designed, and expertly crafted to look and feel refined, elegant and timeless. With recent high-profile coverage in the New York Times, this is an instructive look at the marketing and presentation of hand-blown glassware that could serve as a snapshot of best practices in 2018. Lino Tagliapietra, Aretino. Blown glass, H 25 1/4, W 11 1/4, D 7 in. courtesy: the gallery. 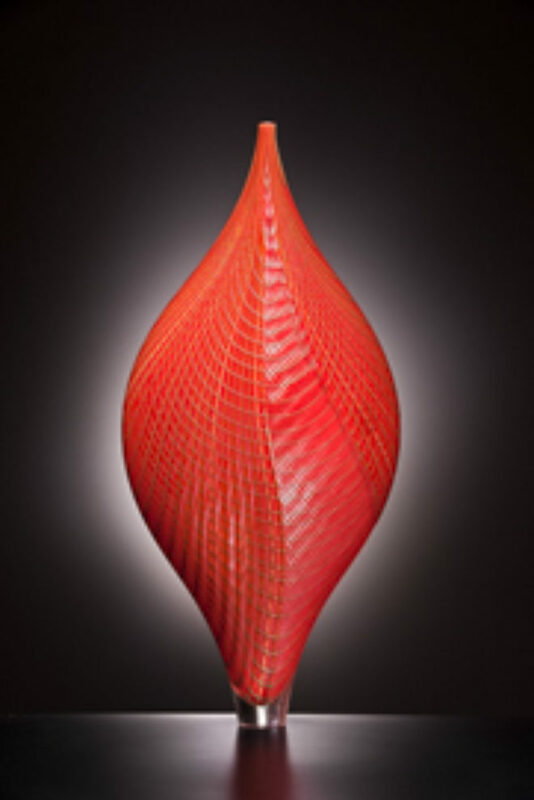 Traver Gallery has three upcoming exhibits that showcase the incredible breadth of glass work. The gallery offers a compelling array for the month of August of breathtakingly intricate, more traditional work from the maestro Lino Tagliapietra in "La Poesia Della Forma" ("The Poetry of Forms, in English). Then there's the bold, shattered and reconstructed glass work in John Kiley’s "Radiant" series. And finally, Traver Gallery will be showing figurative blown-glass sculpture from Preston Singletary's "Beyond the Horizon" series at the Seattle Art Fair from August 2nd - 5th at the CenturyLink Field Event Center. Mary Hong now operates four galleries and three ShardWorx educational and event locations. Never mind that he's well into his eighth decade, Lino Tagliapietra is constantly testing the boundaries of his own skills and imagination, taking color, pattern, and form to new levels of complexity. In a field where many successful glass artists become trapped making one type of work, Lino is constantly reinventing -- from exploration of ever-more-intricate patterning, to unusual vessel shapes on the pipe, to leaving the pipe behind to innovate large-scale glass panels that take shape in a kiln. His startling range is testament to his versatility as a Muranese maestro, a title he earned at the age of 21, when he had already spent a decade learning the centuries-old techniques. His last 65 years have been spent pushing glass-working techniques into new directions, and this spirit seem to be only intensifying as he advances in years. 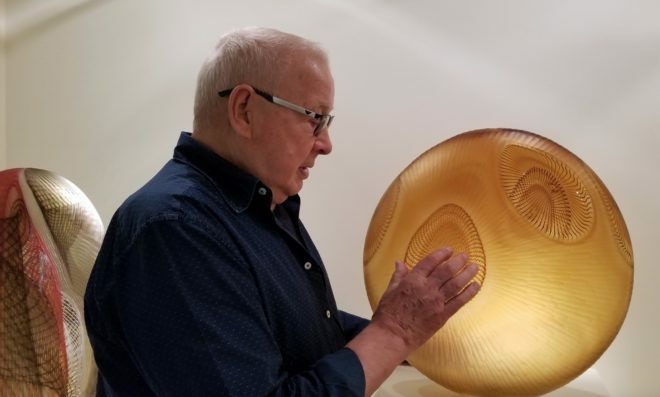 This summer, two leading glass galleries on the East Coast -- Heller Gallery in New York City and Schantz Galleries in Stockbridge, Massachusetts -- featured solo exhibitions of the master artist with openings one week apart. 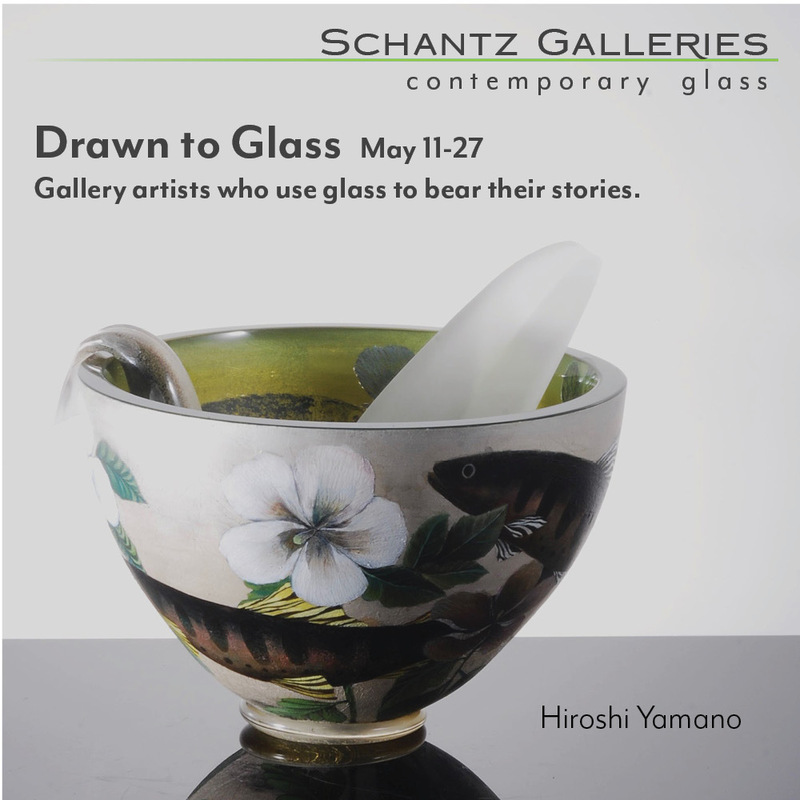 Though some overlap couldn't be avoided, both dealers feature exclusive works, so any serious collector or artist has no choice but to visit both Heller and Schantz to see what glass can do in the expert hands of an inveterate innovator. 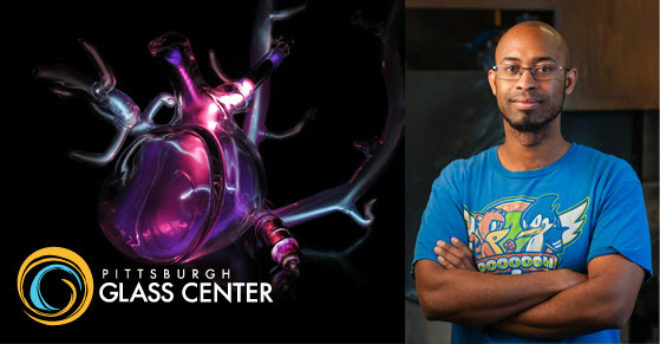 Percy Echols II is the first recipient of the Ron Desmett Memorial Award for Imagination in Glass established by the Pittsburgh Glass Center (PGC). Founded in memory of artist Ron Desmett, this award is given to an emerging glass artist that challenges conventional understanding of the medium and shows great potential in the same vein as the late co-founder of the center. Then a painter and ceramist, Desmett didn’t start his glass work until a year after opening the PGC with his wife Kathleen Mulcahy, a glass artist herself, who in 2002 asked artists from other materials to “think in glass.” Thus tasked, he began blowing opaque black glass vessels shaped inside hollowed out tree trunks which pushed the envelope of the previously polished and pristine glass vessels, embracing the notion that nothing is impossible and that glass doesn't have to be beautiful to make a powerful statement. Tanja Pak, Breaths, 2017. Blown glass. H 17-22, W 17-21 in. courtesy: TR3 Gallery. Conscious breathing seem like a trendy idea, but it goes back centuries as an aspect of religious practice of many faiths. It is also the subject of a new body of work by Slovenian artist and University of Ljubljana fine-art professor Tanja Pak. An artist committed to sculpture, the design of beautiful glass objects, and the architecture of meditative spatial installations, Pak employs her breath to create objects that invite contemplation and self-awareness. 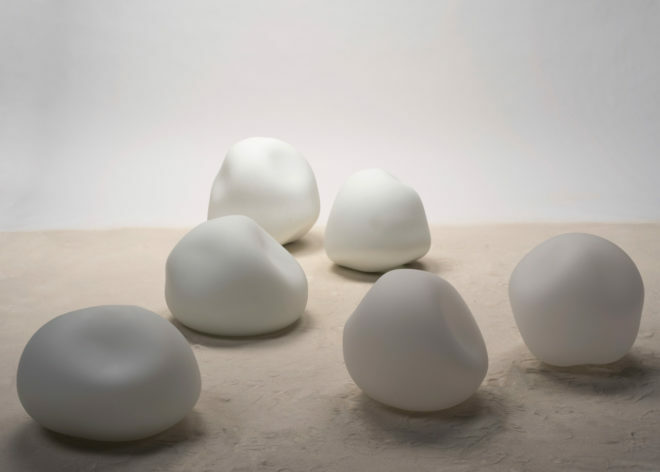 For her exhibition curated by Nataša Ivanović, "The Breath in Between," on view at gallery TR3 in Ljubljana through October 2018, Pak presents a grouping of dimpled white glass forms that bear evidence of their previous state as temporarily liquid hot glass. In these poignant organic shapes that seem to huddle together, Pak seeks to document that meditative moment in between breaths. The gently collapsing glass shapes can be seen as a reference to lungs in mid-exhale. Pak also works in photography and poetry which help to elucidate and expand upon the ideas she eloquently evokes through the translucent glass. It's only June but there have already been 76 murders in New Orleans this year, according to the New Orleans Murder Map created by the local Times-Picayune newspaper. This city world-famous for food and music is also quickly gaining a reputation as one of the most violent in the nation with 157 murders related to gun violence in 2017, earning it third place behind only St. Louis and Baltimore in the grim FBI per-capita crime report. 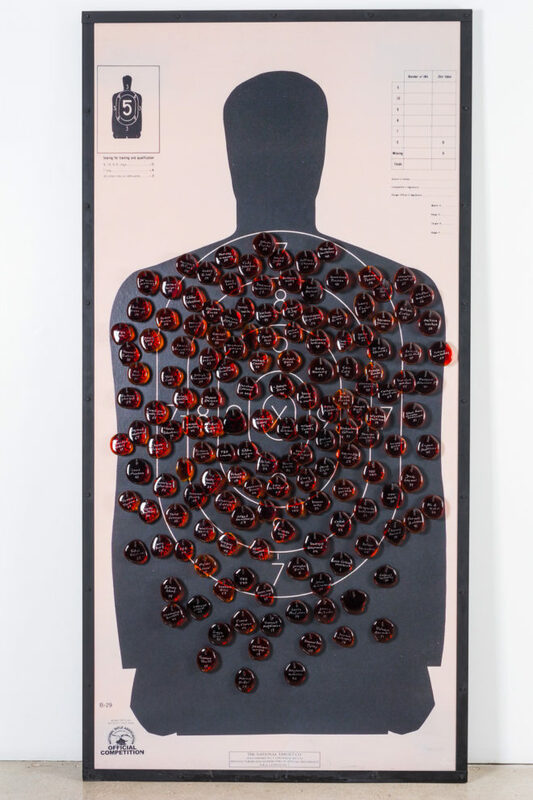 Glass artist and activist Mitchell Gaudet, who was born in New Orleans and who earned his MFA at Tulane, decided the gun issue in his hometown needed to be better understood and confronted through works that turned these statistics into potent artistic statements. Perhaps it's the fact that hot glass must be manipulated with implements but artists sculpting in glass seem uniquely drawn to hand tools as a subject. 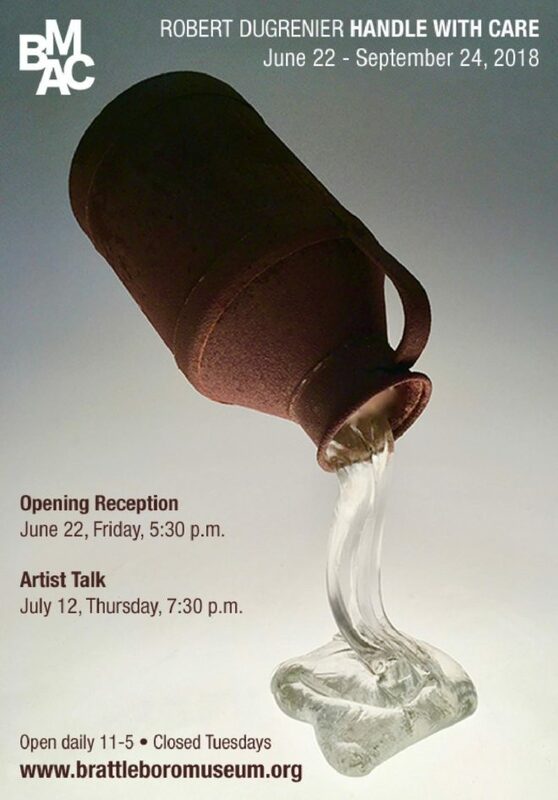 With his latest body of work featured in the exhibition “Handle with Care” opening this Friday at Vermont's Brattleboro Museum, Robert DuGrenier joins Mary Shaffer, Rick Beck, Lou Lynn, and others in exploring the nature and meaning of hand tools by making them, in part, out of glass. (Disclosure: Robert DuGrenier is a board member of UrbanGlass, which publishes the Glass Quarterly Hot Sheet.) Expanding on his earlier series “Out of the Ashes,” in which he combined blown and cast glass with the remains of tools and farming implements in a therapeutic process after a fire destroyed his historic barn in 2015, DuGrenier's new work grants tools a second, more permanent life in glass. By manipulating the glass more intentionally to create potentially functional handles for ax and hammer heads as well as other farm equipment, he mines the rich dichotomy between fragility and strength, making the viewer question the functionality of the tools even as they consider the poetic beauty of their highly evolved forms that make them extensions of the human body. 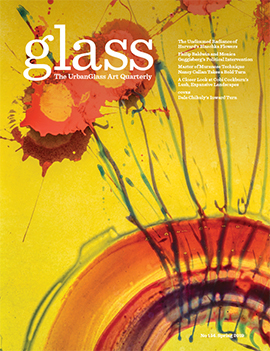 In an exclusive telephone interview with the Glass Quarterly Hot Sheet, DuGrenier revealed insights into his process and approach. 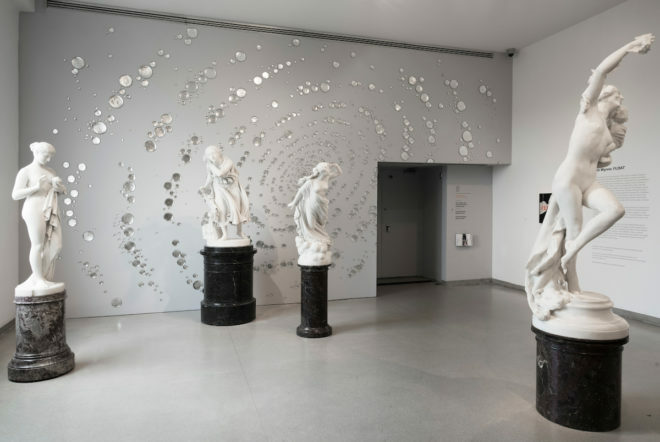 Installation view, Rob Wynne: FLOAT, Brooklyn Museum. photo by Jonathan Dorado.